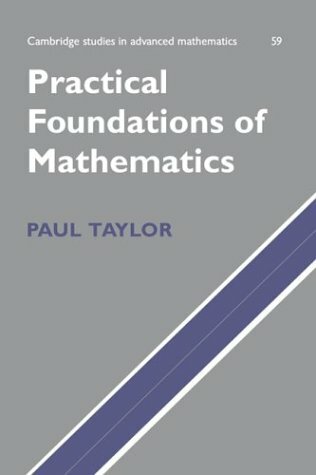 Practical Foundations of Mathematics explains the basis of mathematical reasoning both in pure mathematics itself (algebra and topology in particular) and in computer science. In addition to the formal logic, this volume examines the relationship between computer languages and "plain English" mathematical proofs. The book introduces the reader to discrete mathematics, reasoning, and categorical logic. This text will provide the readers with a free and accessible introduction to a very fascinating subject. The author is not a mathematician by profession, the book shows that pure mathematics is not that complicated once you get down to the rules. by John Wesley Young - Macmillan and co. The following lectures contain an elementary account of the logical foundations of algebra and geometry. Except in a very few instances, no knowledge of mathematics beyond the most elementary portions of algebra and geometry has been assumed. This is a fun and rigorous introduction to pure mathematics, suitable for both students and a general audience interested in learning what pure mathematics is all about. Presented in a friendly, accessible, and nonetheless rigorous style. Basic properties of codes and super matrices are given. New type of super special vector space is constructed. Three new classes of super special codes namely, super special row code, super special column code and super special codes are introduced.